Church planting is a necessary and vital aspect for other churches to fulfill the Great Commission in reaching lost souls; particularly “home missions” in the United States. If you have a local church planter in your area, what are you doing to help them? My hope and desire is that you will not allow the men and women who are laboring in a new work to be an island to themselves, but rather be the shot in the arm and an encouraging and motivated force to help them keep going. My family and I live in a metroplex where urban cities intertwine and the old suburban areas are no longer on the outskirts of town. Cityscapes of shopping centers and housing divisions are everywhere! The population here is continually growing and industry is thriving. Even with Baptist churches of all sizes in our area, God is calling men and women to our area to begin new works because the population growth is so rapid. Baby churches are scattered throughout the cities here, and the church where we help our pastor is one of them. Naturally, church planting and supporting church planters is a living burden on my heart since that is our life now. Do you know if you have local church planters in your area? Do you know their names? Have you chosen to be a blessing to them? Are you their friend? Have you forgotten to keep in touch or pray for them like you promised? Lord willing, these ideas will help you find a way to be a blessing. 1. Fellowship and Food. A church planter needs friends and friends aren’t real friends unless there is food involved! Encourage a church planter by taking him out to a meal and talking with him and his family about their church work. Let them share their heart and listen. Pray with them. If you discern their family is needing more than a restaurant meal, then possibly provide them grocery money or a gift card to meet those needs. 2. Inclusion. 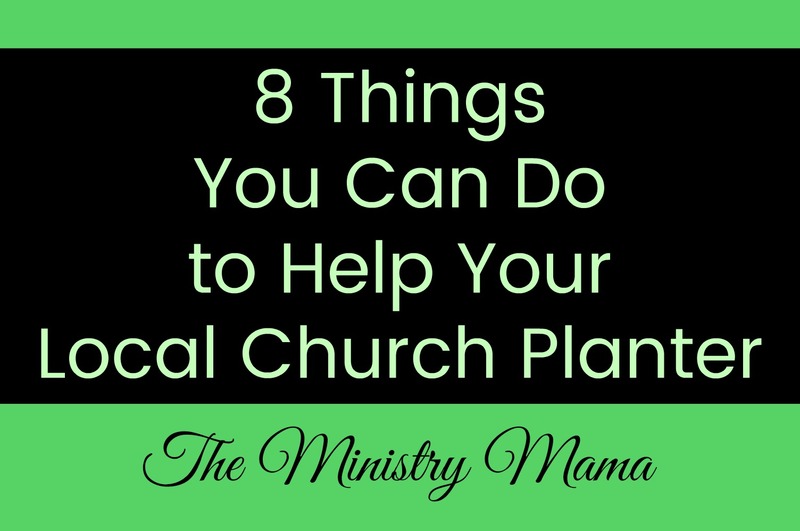 Include your local church planter and his church in your large activities. Consider inviting them to be a part of: church camp, luncheons, revivals, retreats, Bible studies, men’s and women’s meetings, etc. If their church is small they probably do not host their own spiritual growth activities and may miss participating in them. Everyone needs spiritual sharpening times to boost them in their day-to-day routines. 3. A Church Service Visit. Actually attend one of their church services! A neighboring church had a combined afternoon service a few weeks ago and ended their daily services at 2 pm. Several families from their church traveled 30 minutes to attend our church services at 4:30 pm. Our pastor seemed to beam a special smile during his sermon that day. It was a boost in attendance from the two families in our church right now. If you are able to see what is going on in their church plant, it will most likely burden your heart for church planting all over again. And if you can’t go, send a faithful family or two in your stead who will be a blessing. 4. Door-knocking and Outreach Help. Share a pair of feet, or two, or three, or 10! It is a blessing to see other churches send families to help a church planter knock doors and pass out flyers before their very first service. Excitement buzzes in the air and there is a hope visitors will attend. Then, the first services comes and goes, often leaving one man to do his door-knocking alone with his family. What if your church helped your local church planter regularly sending couples weekly to help? Or what if you designated at least two special visitation helps in your “Judaea” and helped sow seed in another man’s fields? I believe that in sowing you also would reap blessings when you see their fields begin to bear fruit. 5. Real Prayer. Don’t just say you will pray for someone… do it! It’s common to take a person’s prayer card or tell someone you are praying for them and not think about them until that card falls out of your Bible or you see them again. Prayer letters hang in churches on bulletin boards as people pass by and names are written in bulletins as prayer requests and can still be overlooked. Make your statement of saying you will pray for that church planter into real prayer for their ministry and family. Invest time in authentically praying for their needs and the souls they are meant to reach. Ruffled feathers show themselves when a pastor believes another man’s church is encroaching on his idea of where the “boundaries” or “lines” of his church outreach should be. Shun the temptation to become a jealous competitor if your local church planter is encroaching on your idea of where he should be. Set that aside and be peaceful. God adds to each local church as He sees fit and can work best with peaceful ministers who refuse competition, criticism, gossip, and hypocrisy. If you see him wave as you pass by. And if there is a problem, just talk about it peacefully and see if you can come up with a solution. Ladies, this can happen with us too. Find a way to push past any jealousies you may encounter and be a real friend and a blessing to the church planter’s wife. 7. More encouragement and understanding, less expectations. It’s easy to shove people and ministries into a box and assume a pastor should be at a certain amount of members by a specific deadline. If you know a local church planter who is still struggling don’t write him off as a failure. He needs your support! If you are able, do what you can to help Him stay faithfully serving God’s call on his life. Church planters need local friends who will check on them, call them, listen, and not compare him with their own experience or with any other ministry. 8. Give Families. Yes, you heard that right, give people rather than dollars. It’s easy to give dollars to a local church planter because you can see the need your area has for the gospel. Challenge yourself to give more than dollars and prayerfully consider giving families to them instead of your dollars. If you have an established church with faithful members you already know what a blessing it is to have help and trained workers who understand the Bible and obey it. What would it do to a new ministry if they had a group of church members to help? Faithful people who were willing to give their tithes and offerings to the new church and help use their talents to reach people, and help disciple them are priceless. We know God loves a cheerful giver and encourages “give and it shall be given unto you…” Why do churches shirk from the idea when it comes to giving families? Do you believe He would supply the needs of your church if you asked a Sunday School teacher or deacon’s family to pray about moving their membership? God most certainly would! It could also be as easy as asking families who live nearer that ministry to consider supporting the church plant. Ask God if He might have you support your local church planter in that way. I know churches do not like to lose folks, but I would rather lose church members to helping another church than see another church plant die for lack of help. All eight of these items are simply an extension of down-home hospitality and sharing your resources and kindnesses to those with the same Biblical mission you have to reach people for the gospel. The impact that caring can do on a church planter can mean the difference between their continuing on in God’s call or discouragement knowing there were people who could help but would not. Through God’s help you can be a blessing!